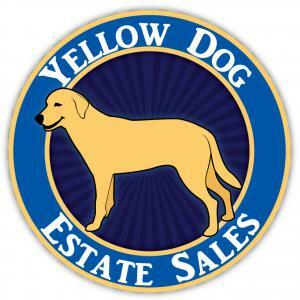 Yellow Dog Estate Sales is a family business that will bring our experience and professionalism to your side and help accomplish your goals in dealing with your possessions or a loved one’s. We are committed to providing outstanding and caring service. Whether it’s one piece or an entire house, we will work with you to establish the best way to sell you items and will provide you with a clear idea of their value. We provide many alternative and combine selling paths to provide the most value for your items. We work on a percentage of the sale. Percentages vary due to preparation and staffing and will be discussed once we have inspected the property. The consultation is free, contact us today! FANTASTIC FULLERTON ESTATE SALE - MODERN AND ANTIQUE FURNISHING - MODEL HOME QUALITY! Yellow Dog's Monthly Warehouse Estate Sale - 4 hour 50% off blow-out sale! ECLECTIC HOARDER ESTATE SALE in LAGUNA WOODS starts THURSDAY, sign-in online 5pm the night before! ONE DAY BLOW OUT ESTATE SALE IN ORANGE - EVERYTHING MUST GO!!! GREAT BARGAINS TO BE HAD. EMERGENCY SALE - NO TIME TO PREP - EVERYTHING MUST GO!!! SO STUFFED! YOU DON'T WANT TO MISS THIS ONE! BREA / FULLERTON ESTATE SALE! GREAT BARGAINS ON EVERYTHING IN THIS MODERN HOME!!! Full House of Beautiful Items - Don't Let the Small Size Fool You!!! Upcoming Yellow Dog Estate Sale - All This and a Boat, Too. Antique Furniture, Crafts & Sewing, Glassware, Kitchenware, Vintage Hats, LLadro, Jewelry, Couch, Chairs, Bedroom Furniture, Clothes, Plants, etc. Fullerton Estate Sale in Sunny Hills - great stuff! This estate sale will be such a treat for those interested in Antique Furniture, vintage games, vintage advertising, milk glass, Fenton glass, and many other antique & vintage items. We're working quickly to organize and will have pictures soon. SHOPAHOLIC'S ESTATE SALE with BICYCLE BUILT FOR TWO - PERFECT FOR FEBRUARY!! !